The New Year has started. Have you made any resolutions for this one? You can make it a special one by giving yourself time to explore your own creativity and expand your artistic skills. Flower Collage is a four-week course originally run in October 2018. It proved to be very popular and it will be offered once more in 2019. Flower Collage is packed with daily mini-projects that guide you towards four larger collage projects. This online course will run from the 4th to the 31st March and is suitable for all levels of artistic experience. Course material will remain online for an extra two months (until the end of May) to allow you to redo projects or catch up. The Early Bird discount offer of £165 will expire on the 4th January. The regular price is £195. To read more about the course and register for Flower Collage please take a look here. I’ve also included feedback from previous students below. You're a generous and talented teacher/artist Este. I appreciate you so much. Thanks for all of this time and information. I just love playing, learning more and more and being inspired by you and others in our course Facebook group. Thank you for this amazing course bursting with so many creative ideas, new skills and so so much beauty. You truly are amazing both as an artist and as an instructor. Thanks so much!! I learned far more than I ever expected. Before this course I didn’t know what I didn’t know. Now I am eager to practice and then learn more. Many many thanks. Thanks for sharing wonderful new techniques and ideas. With this course and the one before, I have gained confidence in what I make and made more time for my art. You are a constant source of inspiration. Thank you Este. As always your online course has been fantastic. You definitely plan and present an extremely thorough course. So much goes into each one... So many fun activities, so many great ideas! Thank you Este for such a wonderful class. I learned so much...not only about collage...color mixing, design....even to let my imagination run wild to make flowers from the letter of the alphabet! Your course was clear and easy to follow, with each step building on the one before it. I look forward to taking other classes from you in the future. Thanks Este! It was a great class. So filled with information I thought my head would explode! You are a great teacher! 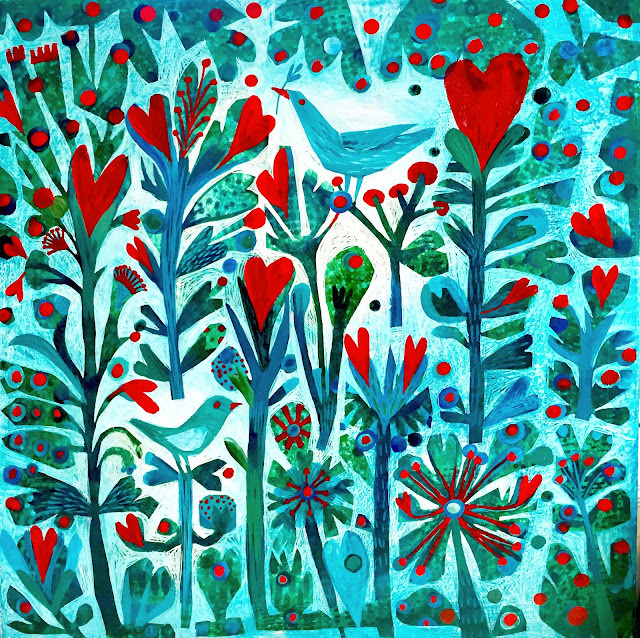 October is here, my new online course, Explore Colour - Flower Collage runs from 1-31 October. Registration closes 1 October. More info on it on www.explorecolour.com I also have other news to share! With 2019 around the corner It is with excitement that I can announce something special: 2019 Wall Calendars! Exclusive offer for subscribers to my mailing list. Calendars and tea towels make brilliant Christmas gifts, so, if you are interested in buying four or more calendars get in touch with me directly. 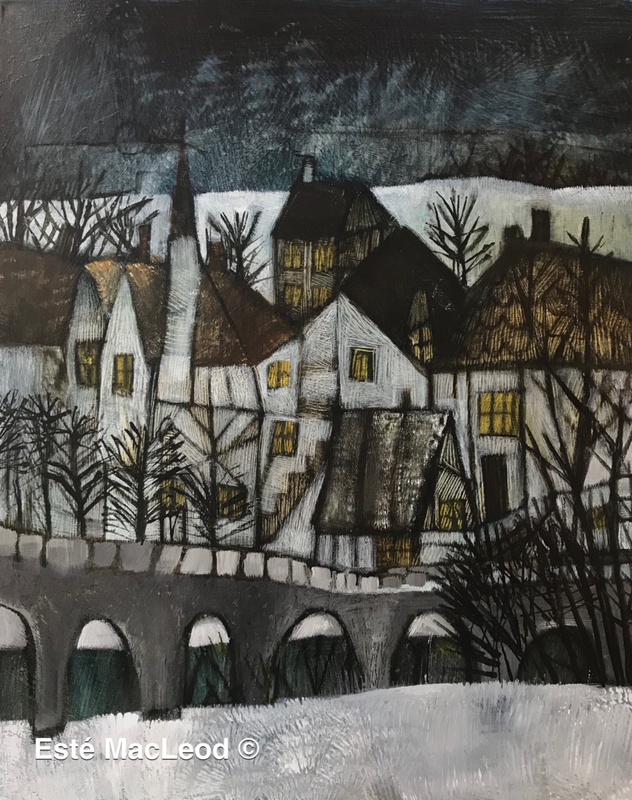 I have a discount offer for subscribers to my mailing list and can send them directly from my studio for a limited time only. Email me on este@estemacleod.com if interested. In July I will be running the month long Creative Leap Summer course. From 1-31 July, twenty six daily projects and four weekend projects will be offered that will be the last drawing focussed Explore Colour course for 2018. The July course is a repeat of the new 2018 Creative Leap course that was launched in February. This is a follow on after the successful first Creative Leap course that was launched in 2016. Once again it will be packed with alternative daily projects to inspire ideas and ignite imaginations. The course can be done during July with four additional weeks in August to catch up, or redo projects. All twenty six projects can be downloaded too. Over the four July weekends, I'll be doing live demonstrations of extended art projects, showing a selection of techniques and processes linked to the basic course. The demonstrations will happen in the Facebook private classroom page. 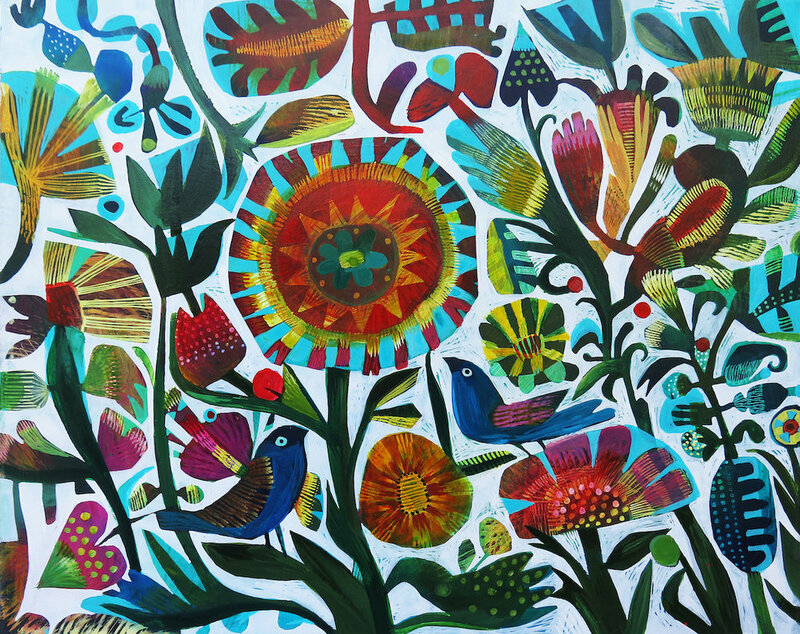 Enrol on Creative Leap at the Early Bird price of £85. This is available until 29 May only! The regular price is £125. Registration for the course closes on 30 June. A brand new Explore Colour painting course will be offered in October. The theme is 'Landscapes' and it promises to be filled with exciting new content. A variety of painting techniques and creative processes will be demonstrated in this course, with the landscape theme linking the projects with the four seasons. Registration will open in August. More on this later. Daily updates of new work, exhibitions and glimpses into my art practice can be found on my Instagram account. In June I will be celebrating a month of colour, with each day will be devoted to a different colour. I am inviting a number of artists and designers to join me. Follow https://www.instagram.com/estemacleod/ to find out more. I will be doing some colour mixing and impromptu painting sessions during this month. #juicyjune is the hashtag to look out for if you are on Instagram. Do you have a favourite kind of fruit? Mine is Clingstone peaches and nectarines, and maybe cherries. I love most fruit actually. Did you know that the vast majority of fruit are pollinated by honey bees? Almost all fruit were flowers at first. It is a bit dreary, grey and damp in my neck of the woods, so I thought I'd create a cheery artwork in praise of the humble honey bee. A daily mini project inspired by flying insects and pollinators will be included in the next Explore Colour onllne course. The course consists of 26 daily mini projects that are inspired by the alphabet, letter shapes and individual handwriting. The themes range to cover all sorts of topics and are suitable for all levels of ability. Four bigger weekend projects will focus on using a variety of art materials and techniques. If you would like more info on the course please see the Kickstart blog post of 1 January. Registration is open until 28 January. Check out my ETSY shop over the next few days if you are interested in smaller original paintings. I will be adding a fresh collection work that is available for global shipping. January is here. One way to kickstart the year with something fun that generates creative energy is to join the next Explore Colour course in February, a brand new Creative Leap that I've been developing over the last twelve months. The first Creative Leap was launched in February 2016. It was so successful it was repeated three times as a live course and I'm in the final stages of getting it ready for publication too. 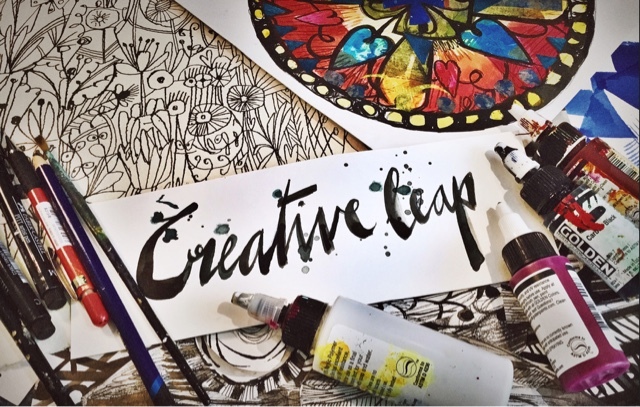 Creative Leap 2018 is the follow up course: it is based on the same ideas and principles as 2016 with twenty-six brand new projects added and four bonus weekend projects (these are optional for people wanting to explore some of the projects in greater detail using different art materials and techniques). Q. What is the course about? A. It is an online art and creativity course, focussing on drawing as basic tool that will lead to an abundance of discoveries and ways to develop art practices, and creativity with explorations of new ideas, methods techniques and fresh observation techniques. Q. Drawing, I don't think I am very good at drawing, is this for me? A. Yes, if you can write you can draw! The course is suitable for all levels of artistic experience, including professional artists, illustrators and designers. In short, as little children we all draw by our own accord. As we grow, we learn how to write by means of letter shapes, the twenty six letters of the alphabet are universally used to create codes in the form of words and sentences. The letters that are universal are written in handwriting which is unique to each of us. In this process most people lose the creative and expressive qualities of drawings we possess as children. By deconstructing the use of letters as fundamental lines, forms and shapes, new ways of drawing, creating and observing are introduced. The familiarity of our own handwriting is fundamental to the process. Drawing skills will also improve for those who are rusty or novices. Q. Daily projects: How much time would this require daily? A. Probably 20-30minutes, but It depends on how much you wish to explore. The nature of the mini projects are to inspire and entice people to want to do more by drawing and discovering new ways to create. Once the basic idea has been grasped, it will open up the way to draw more in this unusual way. The bonus weekend projects will take longer, between 2 and 3 hours. Q. Drawing is mentioned, what else will be covered? A. Drawing form the basis of this course, but it is a way to introduce different mediums and techniques: Golden High Flow or other acrylic inks, watercolour paint, pencils, fine liners as well as non regular materials. A variety of unusual surfaces are introduced for the weekend projects but remember, these are optional: the twenty six mini-projects are the focus of this course. Q. How long will the course material be available for? A. The course runs from 1st to 28th February. Mini-projects are published daily and the majority will have short video demonstrations as well as instructions and images to explain the process or concept. PDF downloadable documents are available for download in order to do the projects at a later stage. The four weekend art projects will be demonstrated in live sessions in the private Creative Leap group on Facebook with access limited to Creative Leap students. The recorded live sessions will still be viewable after the end of February. Q. Materials: the list for Creative Leap is quite long, can I use my own mixed media instead? Q. Why is the course only for a month? A. One of the purposes of the course is to use the daily mini-projects to gain creative momentum. The course is intended for personal artistic growth and the downloadable projects will offer enough information to do the projects at a later stage. After the course finishes, a further four weeks will be made available to view course material. Q. I have done the first Creative Leap course, is this a bit of the same? A. No. Even though the principle is the same, with projects developing mainly from handwriting, there are twenty six different projects, with new topics and creative processes introduced. The course is practical as a follow on from the original course, as well as a stand alone option. Creative Leap is intended for all kinds of artists. NEW: I've included a selection of predicted trending designs and images, in particular aimed at surface pattern designers and illustrators. Q. Can I post course material and project outcomes on my blog, website or social media or use it in my own workshops or demos? A. Creative Leap is intended to develop artistic practices in quite precise ways as developed by myself. Outcomes done as direct results from the projects are not to be shared online please, and Creative Leap concepts are not to be used for individual workshops or demos. Register for Creative Leap, the Early Bird registration is £85, and available until 3 January. Registration after 3 January is £125 and closes on 31 January. Registration is via the Paypal button on the website. An email will be sent out on the 7th of January to give instructions to join the course starting on the 1st of February. Please check if the email address used for registration is the one to be used for course communication. If not, email me an alternative one. The winner is Fran Gracieotropp. Find out more! On Friday at 12PM GMT (London time) I will be giving a live demo in Instagram to explain one of the projects of Creative Leap in more detail. Wishing everyone good health, happy times and much creativity in 2018.